Stardust is proud to be family owned & operated. Stardust is not some overnight flash-in-the-pan venture capital backed "flash site". We are a truly passionate US-based family business that simply loves good design & employs a dedicated customer service team of sweet people who are experts in their respective fields including architecture, construction, lighting and furniture. What started with a collection of vintage Eames chairs, Panapets and Alexander Calder prints turned into something much more significant. With a wealth of knowledge, we turned our passion into something bigger, an unrivaled retail showroom displaying the best 20th century design classics, as well as new contemporary design from today. Our first store opened in 2005 and has become the leading interior design source for a growing base of home owners & trade professionals. We invite you to visit our showroom in Sonoma or browse our website with thousands of product options from our own in-house creations and design houses such as Artemide, Flos, Kartell and Vitra plus many more. From our family to yours, thank you for supporting us. We wouldn't be here without you! Stardust is the largest retailer of modern furniture & lighting in the US. Our retail store offers modern design from Europe, Asia, Australia and the USA. You will discover a diverse selection of unique, hand picked modern design gems. Discover unique products from faraway places like Brazil, Japan, Italy, Spain, Portugal, etc. Our legendary reputation for customer service will guarantee a pleasant shopping experience. Give us a try and experience the best in personalized shopping with our knowledgeable experts. Our store features expansive street-side windows facing to the southwest which offer high visibility. Custom designed acrylite light boxes and high gloss mirror topped fiberglass display cubes show the best of everything on display. The space we occupy is in a historic Art Deco (Art Moderne) building from the 1940's featuring unique modernist touches, adding to the artistic appeal of the location. Yes, our building even has its own Gateway Arch similar like the one designed by Eero Saarinen (just a bit smaller). Our location is right across from the Sonoma Whole Foods Market and within a two-minute walking distance of the historic downtown Plaza. From our prime location in this picturesque and affluent wine country, we are serving a market of 582,893 residents within a 20-mile radius. Daily traffic count is on average 21,600 cars, passing by our showroom, everyday. Sonoma is called the Wine Country for good reason. With 450 small and family owned wineries who call Sonoma County home, Sonoma is a great place to visit. We always tell our customers: "come for design - stay for wine". 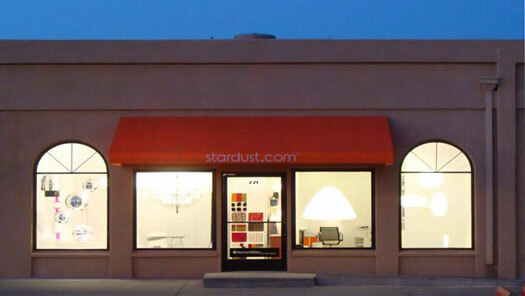 https://www.stardust.com is the online web presence of our retail showroom located in Sonoma, California. Many of the items we offer on our website can also be viewed in our showroom. Please contact us to schedule a private consultation. Shop Stardust for authentic fully authorized modern design classics and the best in modern lighting, modern furniture and home accessories. We don't sell fakes but only the original authorized product bearing the designer's name. Offering the finest selection of contemporary modern lighting, pendant lamps, chandeliers, floor lamps, table- and desk lamps from top brands like Artemide, FontanaArte, Flos, Kartell, Louis Poulsen and Moooi. Update your interior and exterior with our modern and contemporary designer lamps from top designers such as the George Nelson Bubble Lamps, Ingo Maurer Lighting such as the Campari Light, Floatation Lamp and ZettelZ, Philippe Starck Design, Artemide Tolomeo Lamps by Michele de Lucchi, Poul Henningsen PH Lamps, Artemide Tizio by Richard Sapper and Moooi Random Lights. Check out our modern furniture and contemporary lighting floor sample sale, new items added weekly! Contemporary, modern and mid-century modern design lighting and modern furniture by Artek, Artemide, Artifort, Carl Hansen, Eames Design, Flos, FontanaArte, Fritz Hansen, George Nelson, Kundalini, Leucos, Louis Poulsen, Luceplan, Moooi, Philippe Starck, Saarinen, Panton, Vitra and more. Shop Stardust for the best in modern design and lighting for the home and the office and receive FREE Shipping, Lowest Prices and Friendly Service from our modern lighting specialists and knowledgeable interior design experts. Modern lighting and design furniture for any space and budget from Stardust, the best modern design shop in townâï��¢! Stardust is synonymous with beauty, quality, style and innovation. Our collection features outstanding contemporary design collections from all over the world. We offer exceptional pieces in a stimulating shopping environment, both in our brick and mortar retail showroom and through our online presence. Beauty is not an afterthought at Stardust, it is the center of our universe, like the earth circling the sun. There is beauty in all things we take for granted. Naturally, beauty is not limited to objects, exclusively... The intoxicating air of fresh-cut grass after a summer rain. The changing of nature's colors which heralds fall is on its way. The structure and clarity of water, so simple and pure. The beauty of light which has inspired artists throughout the ages. The intense soul-touching quality of sound, which can take us back to places we haven't been in years. Beauty can be anything, it can also be the simplicity of nothing. Beauty can be a smile, it can be warmth, it can be friendship. True beauty is love, the love for life and everything it provides. Look for it, cherish and nurture it. Being a designer is like being a doctor, "Life of a designer is a life of fight, [a] fight against the ugliness that surrounds us just like a doctor fights against disease. For us the visual disease is what we have all around and what we try to do is to cure itâ€ï�� somehow â€ï��with design. To me, this is what makes our job so rewarding, I actually feel like I am making a difference."